Why do you think buying and then restoring yourself is a great option? Restoring yourself vs having a professional? What are some early signs that you should not attempt a DIY? What are a few good “kicking the tires” techniques that help avoid this? What do you look for when looking to buy an RV that needs a little work? What are some easy win DIYs? Besides Airstream, what are your favorite brands to restore and why? Kevin: Alright, welcome to the show everyone. Glad to have your back for episode number two. Today we have with us Michael Vallen. He is the founder of the vintage Airstream travel trailer restoration repair, sale and rental business called NomadMotorLodge.com. And he has years of experience being a do-it-yourselfer when it comes to buying used RV’s and restoring them himself. He’s most excellent at that. So Michael, welcome to the show. We’re so glad to have you here today. Kevin: Yeah, you know what? You’ve got … I’ve checked out your website a little bit and you got some pretty sweet Airstreams. I’m not going to lie. I love the names as well, you’ve got them named, very classic. I love that. From what I’ve learned about you so far though I kind of feel like maybe we ought to call this like This Old RV Show. Michael: Probably, not a bad idea. 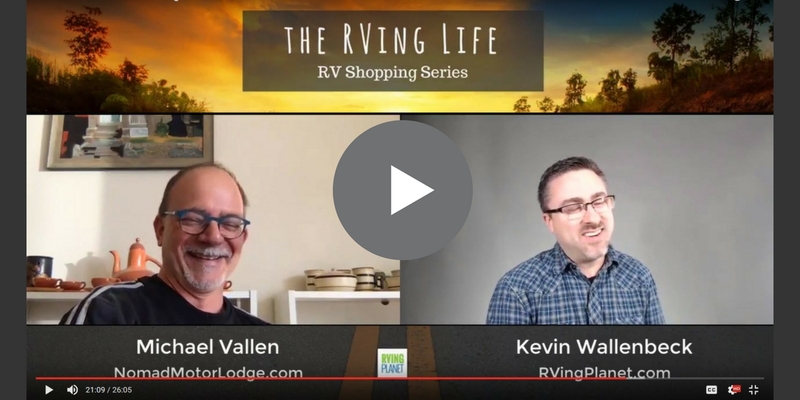 Kevin: Yeah, I was like … I see what you’re doing with those … you’ll tell us more about it as we go on, but seeing you’ve chosen to restore Airstreams as a do-it-yourselfer and you’ll share with us why as we get going. But yeah, I was looking at some of those and your desire to do original work, right, versus upgrading to a lot of the newer amenities and things, just very classic, very original, very cool. So again welcome to show. And just fill us in, man. How long have you been an RVer, and what got you into restoring RV’s? Michael: I’ve been into them since I was a kid, but I never actually bought one until 2010. A lot of wishing and hoping and then finally deciding that I’d either needed to do it or not do it. And the story was I just found an old Airstream on Airstream Classified, and got really lucky, had a great seller and drove eight hours up to New Hampshire and pick this thing up, and never towed anything in my life. And the guy hooked it up to my truck which luckily I had the right kind of truck. Hooked it up to my truck and said, “Just make your turns wide.” And the way I went. So then that led to working on that up, and because of my architectural background I was really curious about Airstreams for years and I did some work on this one, work with a restorer in Baltimore, Maryland. And that got me going and I went out and bought another one which is a complete wreck in the middle of nowhere in Illinois and dragged that sucker on its original tires back to DC in the middle of the night, ended up four tires, out of four tires I had one left by the time I got the thing home. But anyway then spent nine months restoring it. And with the restorer in his shop every day. And then bought the third, did lots of work on that one and now I don’t even know what number were up to. But we have 20 in total right now. Kevin: Wow. That is fantastic. Michael: And they’re not all Airstreams. Airstream is certainly the iconic brand but in working with a really, really excellent … for lack of a better word, a picker that I worked with in Southern New Mexico, I’ve been able to come across and purchased really some of the rarest of the rare vintage 50s and early 60s travel trailers that exist. I knew the collection is quite impressive. Kevin: That’s very cool. And you’ll have to as we get to the end of the show here give you an opportunity to tell us more about how our folks can find those, find you and how to connect with you if they’re interested in renting some of those. So we’ll definitely hit that. But so just for those of you listening out there as we get toward the end of the show we’re also going to have some resources that we’ll make available to you guys as far as some checklists for buying used RV’s, if you’re thinking of buying one, if you’re thinking of buying and restoring, we’ll also have some more resources that I’m sure Michael can give us to point to some restoring ideas and websites online that would help folks, and as well as I mentioned his contact information. So as we get to the end of the show we’ll be looking for those checklists. I know we’ve had hundreds of folks on RVingPlanet.com that have already taking advantage of those checklists and get good results. People emailing back and saying, “Man, I’m so glad. I use your checklist and didn’t buy that one.” That’s over a year. So take advantage of those checklists when we get to end. But we have ways to go before we get there. So if someone … how do you say this, Michael? So if someone’s thinking about buying a used RV, whether they’re going to restore or not, there’s a little difference. You’ve kind of done obviously the restoration method the way you’ve kind of done it. But if someone’s thinking about buying a used RV what are some of the things off the top of your head, things in your experience that you could share that like, “Hey, just really pay attention to these things.” And then just what do you have for us? Michael: Well, I mean water is the most corrosive element known to man. And most people don’t realize, they don’t think of water as being such a bad thing. But it’s actually really, really probably the number one thing that I’ve seen any ways that damages trailers, they’re outside all the time. And because of lack of maintenance that’s just generally what happens with these kinds of objects. They start to leak or bad manufacturing would be another reason or age, the original sealant fail after a certain period of time and you end up with water infiltrating the structural system of the trailer and causing lots of damage that you can’t see a lot of times. It’s really difficult to understand where the water goes and how it gets in and all this kind of stuff. Kevin: Yeah, no, I get that for sure, man. Michael: And I think the other thing is if you … everything has a lifespan, we do, materials do, nothing lasts forever. So when you look at manufactured … things are manufactured even 20 years ago the material, the way we … the material technology’s changed so much that some materials last a lot longer than they used to, but materials from the … some materials from that 50s, 60s, and 70s, they just don’t have a lifespan. They were never intended to last 50, 60, 70 years. They were only intended to last the lifespan of the, the assumed lifespan of the object or the trailer or the motor home. And that’s rubbers, and plastics, sealants, all those things tend to decay really quickly. And so you really have to be mindful of the fact that is there a way to replace those things, is there a way, an easy way and an inexpensive way to replace just the simple window gasket, is the gasket even made anymore. A real common problem with 70s Airstreams for example is they have a double glazed window that’s sort of up in the ceiling on the trailers, it’s called a Vista window, that’s what most people call it. I don’t have any experience with in firsthand but I’ve read story after story after story about there’s no way to take this window apart without breaking one of the painted glass, there’s no insert made to fit this thing. Everything you do to it you have to do yourself. Michael: It requires being very inventive. Kevin: And so I mean obviously you’ve had experience with the Airstreams and most of the aluminum or steel construction, but I mean it sounds to me like you’re telling, what you’re sharing with us is that regardless of the RV if you’re buying something new, you check in for water damage for sure, right, those indicators of sealant where a sealant may not be supposed to be kind of thing, or maybe too much. I know they use, it’s not uncommon at all on the modern trailers to use silicone around things to seal as a maintenance procedure. But if there’s a lot of silicon on there, and I mean that idea, if you see a whole bunch of stuff where it shouldn’t be. Kevin: That’s not the one you use. So what would you suggest someone that even if there’s not silicon being used or that you go to look at a used RV and things look good, would you suggest some type of maintenance from a perspective of and where do they go to find these products that you’re talking about per se? Do they need to go a dealer, can they find them online, what would you suggest? Kevin: When you read it you can believe everything you read too, right? Michael: From Vintage Trailer Supply? Kevin: No, right? No, right? Because there’s so much misinformation. Michael: There really is, yes. There really is. And there’s … even within … and I hate to say this but within some of the forums like Airstream forums, you get a lot of competing opinion. And there’s just not … there’s a right and a wrong way for everything pretty much when it comes to how you tackle a project like this. But one of the other things I didn’t want to pass by that you can really tell if a trailer is not a good candidate is if you open the door and you smell anything that smells weird, because mold grows in these things too, and that’s another really big problem. And then third thing as a curse is rodents, there’s lot, squirrels, raccoons, mice of every kind and creation. Birds, they love to get inside of them. And once they infiltrate the sort of system of the trailer they’re in everything. And the things toast. So you can tell when a trailer’s never had a mouse in it. You really can. It’s completely different. And I bought trailers that are 60 years old that have never had a mouse in it and I proved it by taking the thing apart and finding out that I’m absolutely right. There’s never been a mouse because there’s no trace whatsoever. Kevin: Yeah, I know rodents are definitely a common issue. A lot of times when someone’s looking to buy a used RV and they pull up to the house and it’s sitting in the side yard with grass growing up so high you have to get a sickle to get to the front door. And I mean even though simple things like that just shows you that it’s not well taken care of. Kevin: And they weren’t paying attention and just … I mean, I know this sounds really crazy, we have an RV and it’s on our backyard. And we had a cat, since we’ve own, we’ve owned a couple different RV’s, and they’re more modern ones, we bought new. And so we’ve had a cat, just an outdoor garage kind of cat for a long time. And a year ago he ran away or disappeared or whatever cats do when they don’t come to eat anymore, right? So that last summer, spring I realized … I went out to the RV, I check it pretty frequently. And went out there and went inside and I didn’t smell anything but it just felt like something was kind of not right, I don’t know. And I checked a little bit, found a couple mouse droppings, got some traps in there. Didn’t have a real problem but we got another cat, last fall and I’ve been checking the RV man, no mice. Kevin: So if you pull up and someone’s got their RV in the side yard and they have an outdoor cat. That’s a bonus. I mean, just silly things you don’t think about. Michael: I’m always surprised by the … determination is a lot of what it takes to conquer these things. There’s so much information, I mean, a million different sources online for how to do things. I’m always really quite surprised by people’s capabilities. So I would never say that you’re not a candidate just because you’ve never tackled a construction, something where you’re building with tools. I would say be careful and learn how to use a tool before you actually are going and using it. But it’s a pretty easy to learn. What I think people don’t recognize is that they’ll purchase run out and see, “Oh my God, I fell in love with this thing.” And drag it to their house without having really thought through, “Well, I got to take it … if I have to take it apart, do I have the space to do that? Am I going to be working outside? Do I have to worry about weather.” And that list, “Do I have a place to set up a mini workshop or a wood shop.” And I think a lot of … and I’ve seen this a million times people will buy these trailers, any different, any kind of trailer. It doesn’t really matter new or old. And start, it’s very easy to take them apart and it’s not putting them back together. And they end up with this thing, sitting in their yard and they spend a fortune on it, it’s in pieces, nobody wants it, even if it’s vintage nobody wants it, and they end up selling it for a gigantic loss, being really depressed because they took on too much. That’s really, I think you really have to be careful on what you buy, make sure that it’s not a candidate for a complete take-apart and rebuild, that it actually is sound and can be used the way it is and that you’re doing a cosmetic renovation to it which is much easier to do. Or get yourself into something that you really can handle. That’s really what it’s about I think. And the finances, it’s not cheap to do this. That is the worst hit ball everyone makes, myself included. They are not cheap to do. You’re basically building a little house. Kevin: Most people are familiar with restoring, building a house or restoring a house, things like that. An RV is a house on wheels. It’s different obviously in the sense of how it’s destructive and put together and other components were put together, but is it a similar, I mean, is it similar to that that you’ve experienced of that remodeling or updating a house as an RV? Is it the person that’s comfortable going and redoing their staircase or putting a new floor in their house? Even if they’re capable what might be some challenges, and you mentioned some things about space and time and tools and things like that, I guess, so maybe that they cover that but would that person be a good candidate? What do you think? Michael: Yeah, I think so. What I think is kind of funny, I see this all the time on various Instagram feeds or pages that I follow, people, they tend to think that … just a wild example, not anyone in particular. I’m a carpenter, so I’m going to take my super lightweight aluminum travel trailers, aluminum frame and skin travel trailers from the 1960s and I’m going to put the entire interior in old barn wood for example. I’m going to add another thousand pounds of material to this thing. And then I’m going to go and I’m going to take that really slick aluminum skinned bathroom, wet bath that has a super lightweight toilet in it and a super lightweight sink all integrated together as a component. And I’m going to change that and I’m going to put in little tiny tiles and I’m going to put in a thermostatically controlled faucets on there or diverters on the shower and I’m going to put in a big composting toilet. I mean, I’m going to do all these crazy things, big vessel bowl sink. I look at that stuff and I go, “Well, that’s great in a house. And it’s not great in a trailer.” Because they weren’t designed, they were designed to carry a load which was a transient load, but they weren’t designed to carry all this heavy stuff. And they certainly weren’t designed to have tile put in them because it’s just going to pop off. I mean, as you’re driving down the road it’s just going to fall apart. So I see that kind of stuff and I just sort of scratch my head and wondered. But that comes from someone who just doesn’t realize that they don’t translate 100%. What you do in your house doesn’t really translate. What you see that reminds you of your house in a travel trailer or in a motor home is really something very different. Behind it is a very slender supporting frame for cabinetry, a lot of times really efficient plumbing layouts, really lightweight, everything, because it’s all about efficiency. It’s not about, “Let’s make this thing as heavy as you possibly can.” But for me all tiny house makes no sense. What are these people thinking? Kevin: Be careful, you’re going to offend a lot of people watching this video. Michael: No, I don’t mean to, but I just like … It doesn’t make sense. Kevin: No, do you know how many people watch tiny house shows, man? They’re all over the place. It’s crazy. Michael: I know. But the original tiny house are these darn trailers, and I mean, I just know they’re so much better design than any of the tiny house things I’ve seen. I watch all the shows too. Kevin: That’s funny. That’s awesome. So just I mentioned a little earlier we’re going tell you about some resource. I want to mention we do have some … again they’ll be in the show notes, but we do have some used RV checklist. We have specific ones for motor homes, travel trailers, fifth wheels, and small pop-up camping trailers for you guys listening and watching out there. And I encourage you to take advantage of those. They just really truly help when you’re going to buy that used RV and you just want to confirm. It covers things like Michael said, the odor, and sealants and damage on the roof and cracks, and I just want to really make sure, because man you buy something and think you’re getting a good deal, you get it home and all of a sudden you got a $2,000 roof repair or more. And it’s like, “Oh, that’s not what I was expecting.” So I really encourage you guys to take advantage of those checklists on there. Mike, we’re going to get finished up here. But I’m going to give you kind of the last word. What final advice do you have for someone kind of looking to get a new RV that might need some fixing? What would be like … you mentioned quite a few things, maybe you repeat one, maybe you got something tucked away down there that you’re like, “Oh, yeah.” Final advice for someone looking to buy an RV that they’re going to kind of fix up or get roadworthy for themselves. Michael: Just I think it’s important to really educate yourself, read up on what your lifestyle is going to be most suited to. The whole vintage world is certainly very appealing and there’s a lot of nostalgia and all that. But it’s a very different sort of way of traveling and using. I highly recommend that folks if when … with outdoors you can rent, with RV sure you can rent. Go out and rent a bunch of different kinds of trailers. There’s a million, hundreds and hundreds of different kinds. Rent an old one, rent a new one. And really know what is going to work for you. And before you embark on a big project even if you think you found the greatest deal on earth, make sure you understand what the skill levels that are going to be needed and what the costs are for replacing systems. And I’ll tell you sort of last thing, if you buy any kind of trailer from the 1950s or 1960s, if it’s going to need to be completely rebuilt from ground up, no matter what, unless it was kept in a garage its entire life, and even those will still need some amount of work. But I have yet to find one example of a vintage trailers that I come across, and I’ve come across hundreds and bought 20 that didn’t need to be taken completely apart and rebuild. Kevin: Awesome. That’s fantastic. Again, I appreciate you coming on the show today. And I know that other folks are thinking about buying something really old and restoring it or they’re thinking of buying something relatively newer that’s used, the tips you gave us today are going to be super helpful for everybody. So just give us a quick update on kind of what you have coming up. I know you said you have 20. I looked at your website there which is a NomadMotorLodge.com, we’ll have that link in the foot notes here as well. And I saw some cool restorations you have for rent on there. Just give us a quick update on what you got going on, what’s coming up, and how folks can get a hold of you. Michael: Okay, we have our … we have some trailers to rent in the East Coast, moving the restoration business to New Mexico starting in May. We purchased a property in the Jemez Mountains which is about 45, 50 minute drive for either Santa Fe or Albuquerque. We’re setting up a sort of camp there where people can rent trailers from us or come and visit if they want. We also purchased a cafe which is going to work in conjunction with our campsite so that we can host events for doing a big corporate thing in the summer and wedding so far. Michael: And as well we do trip planning, so if someone has an interest in touring the Southwest in a travel trailer we have the trailers, we have the trucks, we have the knowledge of the area to sort of set you out on an amazing journey. We can put together just about anything. And the website is the best way to get a hold of us. We do all our rentals through Outdoorsy.co and all that’s on the website and pretty self-explanatory. Kevin: Well, fantastic. Well, I think everybody that wraps up the show for today, this episode. And until next time, happy camping everyone. 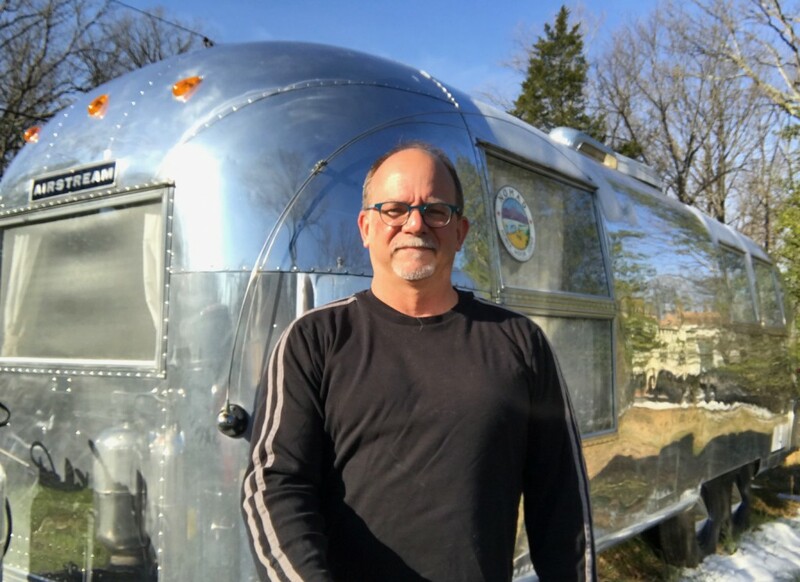 Michael Vallen is the founder of the vintage Airstream Travel Trailer restoration, repair, , sale and rental business, called Nomad Motor Lodge. 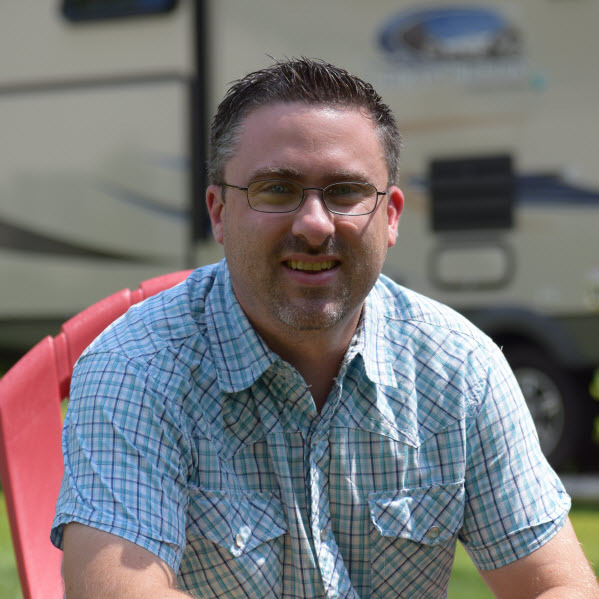 He has years of experience being the ‘do it yourselfer’ when it comes to buying used rvs and restoring them.